Moving a Big Sur grill around is easy with the specially crafted Series 304 cart. The cart is constructed with the same quality stainless steel, so not only will it take the heat of the grill, but it will also blend seamlessly with the grill for a professional look. 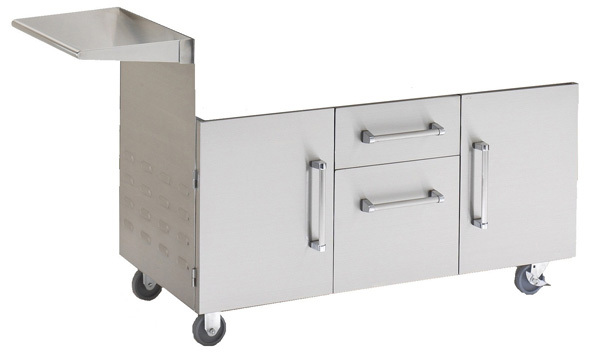 Resting on heavy-duty casters, the cart features a storage compartment as well as two drawers for storing aprons, spices, and utensils in one convenient location. An additional pullout drawer can house a propane gas tank or provide easy access to the natural gas hose connections. There's no need to limit location when you can take your grill with you. Stainless steel cart provides reliable mount for the Big Sur gourmet grill. Features multiple drawers for storage and a pullout drawer for a gas tank or natural gas hose access. Rests on heavy-duty caster wheels.